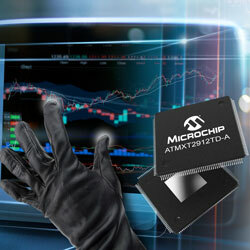 Microchip offers a new family of single-chip maXTouch touchscreen controllers created to address challenges in the design of modern automotive capacitive touch systems with screens up to 20″ in size. As touchscreen displays in cars grow bigger, drivers expect screens to work with the same touch experience as mobile phones. However, screens in vehicles need to meet stringent head impact and vibration tests, and consequently, have thicker cover lenses that conceivably impact the touch interface performance. As screens get bigger, they are also more likely to conflict with other frequencies such as AM radio and car access systems. The MXT2912TD-A offers nearly 3,000 touch-sensing nodes, and MXT2113TD-A, supports more than 2,000 nodes, bringing consumers the touchscreen user experience they demand in vehicles. These new devices build upon the company’s existing maXTouch touchscreen technology that is broadly adopted by manufacturers worldwide. The company’s latest solutions provide superior signal-to-noise capability to meet the demands of thick lenses, even supporting multiple finger touches through thick gloves and in the presence of moisture. As car manufacturers use screens to succeed mechanical switches on the dashboard for sleeker interior designs, safe and reliable operation becomes even more crucial. The devices include self and sensor-diagnostic functions, which continually monitor the integrity of the touch system. These smart diagnostic features support the ASIL classification index as defined by the ISO 26262 Functional Safety Specification for Passenger Vehicles. The new devices highlight technology that allows adaptive touch using self-capacitance and mutual-capacitance measurements, so all touches are identified, and false-touch detections are avoided.